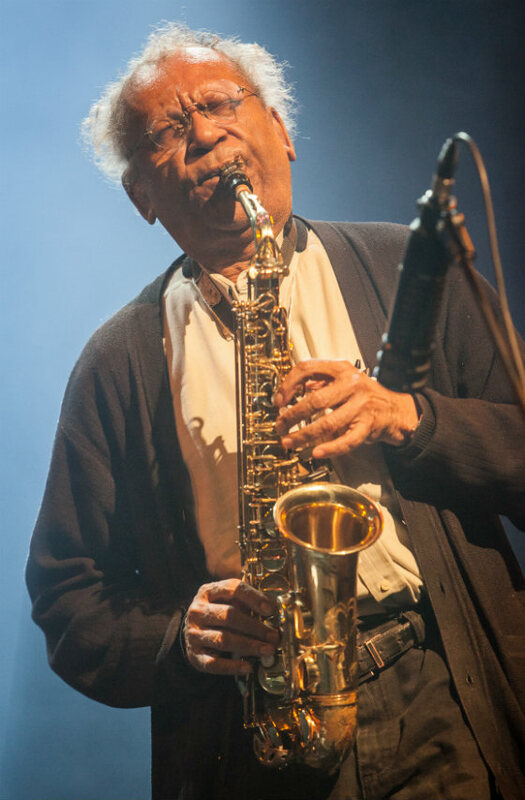 Anthony Braxton is one of the key figures of the international avant-garde jazz scene. He's now 71 years old, and last night (May 21), he played a gorgeous 71-minute solo set on tenor sax. 49 years after the release of his first groundbreaking solo sax recital, For Alto, Mr. Braxton is still a force to be reckoned with. A solo sax recital is one of the more gruelling exercises a person can do, but damn, he pulled it off with aplomb. He may have taken an extra few seconds between pieces to wipe down his horn, but his tone and breath control were excellent throughout. And his playing was full of invention, variation and beauty. The ballads he played were in line with the melodies favoured by alto players he's long known and loved. I heard ghost-tints of Warne Marsh, Lee Konitz, even Johnny Hodges. Besides ballads he played freak register skronks, and lots of the angular, snake charmer-like trills up and down pieces that I've often heard at his solo concerts. According to the program notes, this was Mr. Braxton's first solo set in five years. Whether that's the case or not, I can't say, but it was a really great 71 minutes of music. And all of us who were there are damn lucky to have heard it.